We are now ready to explore Adaptive Foresight, the main model for doing good personal and organizational work that we offer at Foresight U (4U). The model began with a collaboration between foresight professionals Josh Davis and John Smart in 2014. It has since been further developed by John, with annual feedback from foresight and industry experts. Adaptive Foresight is the systematic and iterative (repeated, cyclical) practice of the Three Ps foresight skills in a management environment, whether managing oneself, or collectively on teams, in organizations, in governments, or as several billion unique intelligences all living on one precious planet. It involves Four Foresight Steps (Learning, Anticipation, Innovation, and Strategy) and Four Action Steps (Executing, Influencing, Relating, and Reviewing), continually applied to the environment. It is our model for well-managed strategic foresight, successfully executed by the relevant actor (individual, team, organization, society), in a way that improves that actor’s ability to survive and thrive. In this model, good foresight practitioners must use all Eight Skills of the Do loop to successfully manage any project, product, or service. The figure below arranges the Eight Skills graphically into the Do loop, and references the authors of the change models mentioned above. From a cognitive science perspective, the Do loop is a perception decision action (PDA) cycle. These have also been called perception action cycles in cognitive psychology (Roger Sperry) and in ecological psychology (James Gibson). For some of the science of PDA cycles, see Pecher and Zwaan’s Grounding Cognition, 2010. To understand the Eight Skills in terms of a PDA cycle, we can observe that Learning and Reviewing are primarily environmental perception skills, the three Seeing skills begin as perception but end as mental decision skills, and the Doing skills are action skills. Yet as Learning (about the past and present) is necessary preparation for foresight, and as Reviewing (getting feedback, measuring success) always involves action, we can simplify this PDA perspective to simply call the first four skills the Four Foresight Skills, and the second four skills the Four Action Skills. That is mentally easier to remember, and nothing is lost if you remember they operate in a cycle. Because PDA cycles determine how we think, they are are at the heart of foresight, management, and leadership. To a rough approximation, our intelligence, biases, and the learning and that we do determines what we can see around us, and in our relevant past. Our values, goals, anticipation, innovation (mental and physical creations) determine what we can see ahead, and our analysis and strategy determine our decisions from all that hindsight, insight, and foresight. To implement those decisions, we must rely on our execution, influence and relating to do, and our reviewing to stay on track, and to determine what the right track should be. Over the long term, to get beyond short term surviving to long-term thriving, adaptiveness also requires adoption of a universal set of values and goals, in addition to our own additional (and more experimental) personal, organizational, and societal values and goals. Those universal goals will have to be kept at the center of our learning, seeing, doing, and reviewing, for us to be adaptive in the long term. Our proposed set of Five Goals and Ten Values of all complex adaptive (evo devo) systems is our best model for such goals and values, but we each must do our best to find our own universal models, and to keep the values of empathy and ethics at the center of our work, as in the Five Goals. The Adaptive Foresight model helps us practice successful strategic foresight at various mental levels of practice: There are at least seven levels worth remembering, so let’s review them now: loop, triad, skills, goals, specialties, models, methods. Loop. 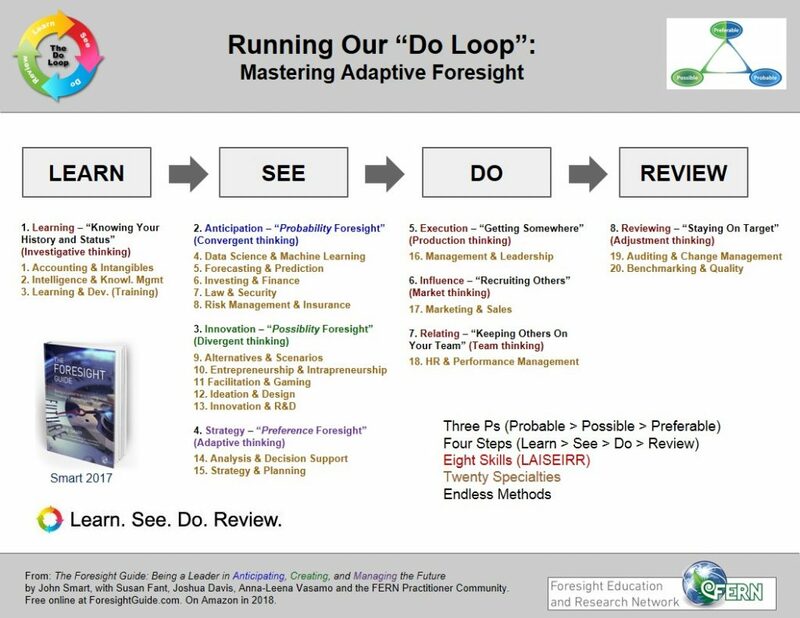 The most obvious level of practice is to remember that all adaptive foresight occurs within a four step learning-foresight-action-feedback cycle, which we can call the Do loop. Skills. Adaptive foresight requires the application, balancing, and looping of all Eight Skills, which we can more simply think of as Four Foresight Skills and Four Action Skills. Goals. In applying the Eight Skills, each of us must determine our own goals and values, and also seek to find and use ones that are universal to all cultures and contexts. See our Five Goals and Ten Values for one set that may be particularly universal. Whatever your model, we recommend that it have the values of empathy and ethics at its center, as those values are each forms of intelligence that are absolutely critical to long-term adaptiveness. Specialties. Each of the Eight Skills relies on its own set of organizational management specialties. Our model for those is the Twenty Specialties in personal, team, and organizational work. We classify these specialties by the Eight Skills, and discuss each in turn, in Chapter 5 (The Do Loop). Models. Each of the specialties generates its own practice models. Some are used generally in that specialty practice (law, entrepreneurship, accounting, marketing, etc. ), some specific to certain types of organizations or industries. Some are generalizable to all organizations, or to humanity at large. We’ve offered some generic models, all of which are foundations for organizational foresight, in Chapter 4 (Models). Methods. Each specialty in turn generates a number of foresight methods (recipes, algorithms, practice routines) to support its work. We introduce methods, again classified by the Eight Skills, in Chapter 6 (Methods and Frameworks). I would like you to consider the Eight Skills as a coherent and minimally complete set of skills for adaptive foresight. By contrast, the Twenty Specialties, and the methods and frameworks introduced in Chapter 6, are far from a complete set. They are starter set of business skills for integrating foresight into management and leadership that you should modify to best fit your client and context. Nevertheless, these twenty are our best current model for the most useful specialty practices for foresight work in the organization. Here then are the Twenty Specialties, classified by the Eight Skills. Accounting & Intangibles, Intelligence & Knowledge Management, Learning & Development. Data Science & Machine Learning, Forecasting & Prediction, Investing & Finance, Law & Security, Risk Mgmt & Insurance. Alternatives & Scenarios, Entrepreneurship & Intrapreneurship, Facilitation & Gaming, Ideation & Design, Innovation & R&D. Analysis & Decision Support, Strategy & Planning. Human Resources & Performance Management. Auditing & Change Management, Benchmarking & Quality. The Eight Skills are proposed as a minimum viable model for workplace foresight and leadership. One should expect such a skill-centric distribution in any good model of foresight. Again, the Learning skill is foresight preparation, and three Seeing skills are foresight production. Including fewer skill categories than these eight would ignore some key features of the organizational foresight process, and having more categories would be unnecessarily complex. Notice that the largest set of adaptive foresight specialties, five each, are found in Anticipation and Innovation, the first two of the classic Three Ps foresight functions. The next largest set of specialties, three, is found under Learning, that critical precursor skill to foresight. The third largest group of specialties, two are used in preference foresight, under Strategy. Thus Learning and the Three Ps, as a single group, comprises fully fifteen of the Twenty Specialties of adaptive foresight. Finally, Review, the critical feedback we need from action to institute further Learning and restart the Do loop, gets two specialties as well. As Boyd would argue, we recommend foresight practitioners focus first on getting the right speed, efficiency, and number of turns in their Do loop for each client problem and for their own self-monitoring. Second, we recommend practitioners focus on growing their understanding and use of each of the Eight Skills, discovering their skill deficiencies, and deciding which specialty strategies and methods can best help them improve each skill. As we’ll see at the end of this chapter, we can also use the Eight Skills for leadership development, where we call it Adaptive Leadership, and can relate it to a well-known modern leadership model. We will occasionally color “adaptive” terms not just in red (an important concept), but in purple (strategic, preferred) to remind us that adaptive strategy (or more precisely, executing adaptive strategy, Skills 5 and 4), allows us to achieve both environmentally successful and preferred futures. By definition, such futures are at the heart of good leadership. Before we delve further into Eight Skills, let’s look briefly at a two other management models with similar numbers of categories, to see how our model compares. Every evidence- or theory-based management model has some useful insights to offer, and I recommend study of these two and other management models. Yet it is also important, in studying models, to seek out the most grounded and universal ones we can find. One model in popular use is Henry Mintzberg’s Ten Roles of Management. The figure at right outlines Mintzberg’s Ten Roles. Below is my assignment of his Ten Management Roles to the Eight Skills, based on his descriptions in Mintzberg on Management (1989). From my perspective, Mintzberg’s model offers some useful distinctions on the relating skill, but it greatly downplays the anticipation skill. Anticipation is a central strength of forecasters, predictors, risk managers, investors, law and security personnel. His model also downplays the execution skill, a central strength of operations and project management staff. Consistent execution is core to adaptive management. A variety of kinds of execution strengths are covered in Gallup’s StrengthFinder, as we have discussed. Another model worth reviewing is Meredith Belbin’s Nine Team Roles. The figure at right offers a good overview of Belbin’s roles as strengths and allowable weaknesses on teams. 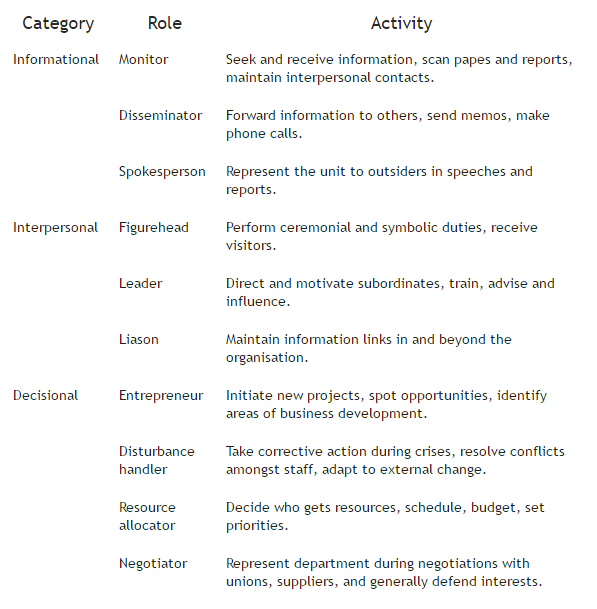 Belbin’s original descriptions can be found in Management Teams (1981), and Management Teams, 2nd Ed. (2004). Below is my assessment of his Nine Team Roles with respect to the Eight Skills. 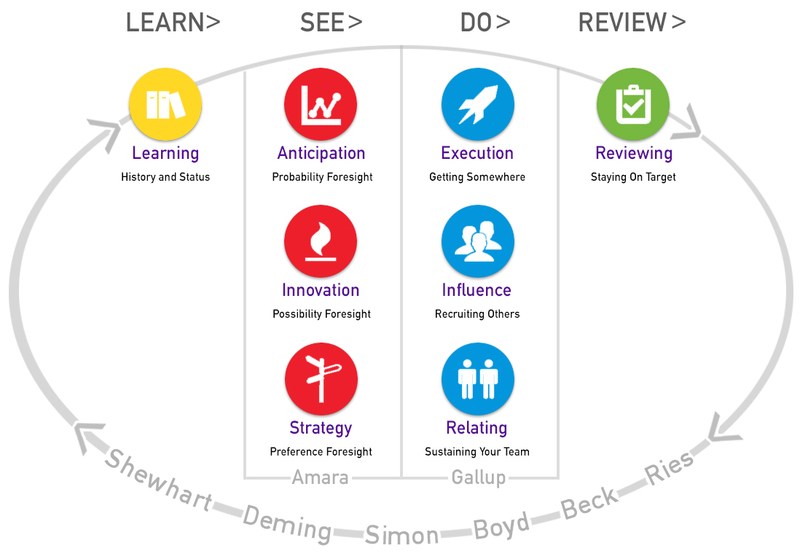 Note how Belbin’s model offers not just one but two important team roles in each of the Learning, Execution, and Reviewing skills. It offers particular depth and discrimination in those areas. At the same time, the model presently overlooks the anticipation skill, just as does the Mintzberg model. Perhaps this is not surprising, our culture has a cognitive bias against anticipation (predicting the most probable future) as a conscious process, though we do it unconsciously all the time, as described in Why Think About the Future? in Chapter 1. Consciously, we tend to see the world as more chaotic and unpredictable than it actually is. Yet evo devo theory, the 95/5 rule, and predictable long-range change in physical and chemical sciences all remind us that while perhaps only 5% of natural processes may be easily predictable, those 5% seem equally important to the 95% that we can’t predict, in both organisms and in any evo devo system, as they constrain several features of the future of that system–in other words, they are developmental, not evolutionary. Many of the folks who serve as forecasters, predictors, engineers, scientists, risk managers, investors, law, security, and intelligence personnel are all biased to prediction, and these folks need to be represented in any good team model. Observe also that Belbin’s model currently ignores the influence skill. This is a bit more surprising, as selling, wooing, convincing, marketing, and credibility building are all constantly being done on teams. Belbin added Specialist to his model, after receiving feedback. 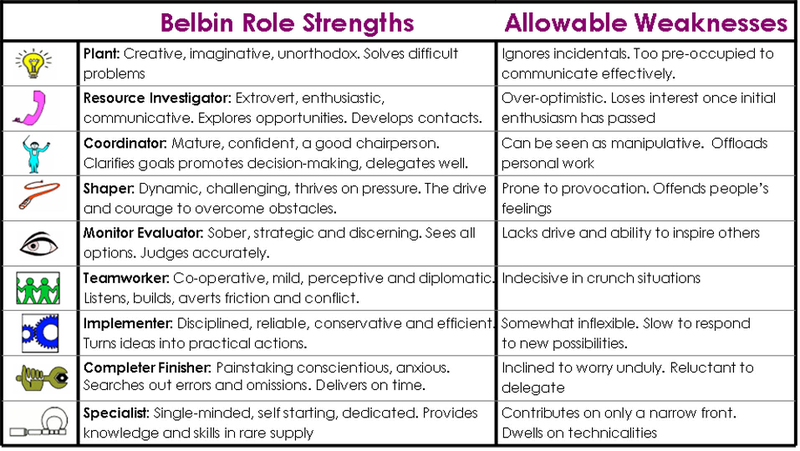 I hope Belbin will add new roles in anticipation and influence categories as well in coming years, and some of Mintzberg’s categories as well, as I particularly like this model and think it deserves greater use. Here is the (~$50, 20 min) Belbin Team Roles assessment. Let’s look closer now at each of the Eight Skills in turn, and discuss some ways they are used to generate foresight in organizations, and how foresight practitioners can use each skill with their clients. At the end of the chapter, we’ll also consider how the eight skills relate to leadership, as each of us are (better or worse) self-leaders, whether we presently recognize it or not, and some of us are aspiring relationship, team, and organizational leaders.